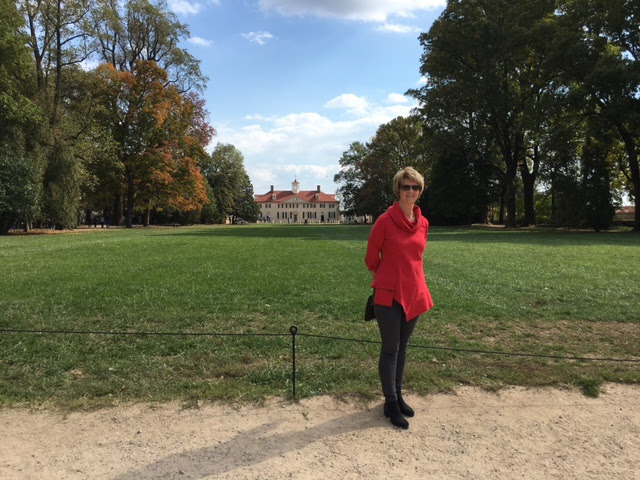 Mount Vernon – Let's Go RVing! We decided not to set the clock for this morning but I was hoping we’d get on up and out by 8:00 since it’s a couple of hours drive to Mount Vernon. That didn’t happen! We finally got on the road about 9:45 and after a slight detour were on the way. It’s close to Washington DC so I told Jerry if there was anything he wanted to see in Washington now was the time. For some reason the GPS didn’t work initially, just giving us our location. When we finally figured out that we didn’t know where we were heading we put the information in again and this time it worked but… it took us the long way. In fact it took us nearly three hours to get to Mt. Vernon. Fortunately we hit the traffic at a good time so we had no delays or slow/stop traffic. We got to Mt. Vernon around 12:30 and upon arrival decided to view the introductory movie that highlighted what there is to see an do on the grounds and also showed scenes from the French and Indian War. It was very good and enlightening. Our time for the house tour was 1:20 but we were told since it was a light day it would be ok if we weren’t there at the appropriate time. I’m glad it was a light day because there were a lot of people there! The house sits right on the Potomac with an absolutely beautiful front porch view. I could just imagine George and Martha Washington sitting on that porch in their rocking chairs although from the sound of things there wasn’t a whole lot of sitting time. The rooms were recreated as they would have been when the Washingtons lived there and nearly every one of them had at least one piece of original furniture. Several of the rooms were painted with pretty vivid colors which was a sign of prosperity as paint was very expensive. It arrived in powder form and then was mixed with linseed oil. Any leftover was safely stored. There were lovely paintings all through the house, some of them original. After the house tour we walked around the various out houses and viewed the gardens. We visited the tombs of both Martha and George Washington. 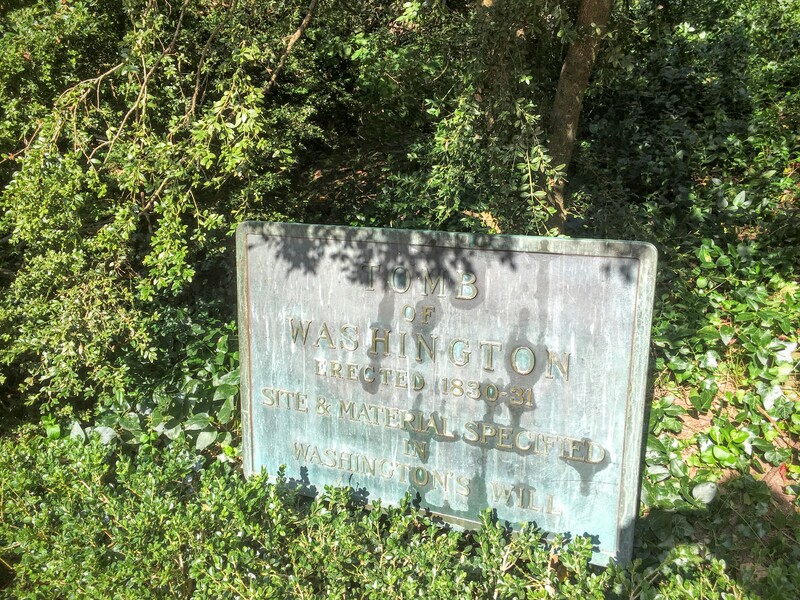 General Washington as he preferred to be called was originally buried elsewhere on the property but it was near the shore line and was deteriorating. He had left instructions in his will for the mausoleum to be built and then their bodies were placed there. There are some other family members buried there as well. On the walkway waiting to enter the house. 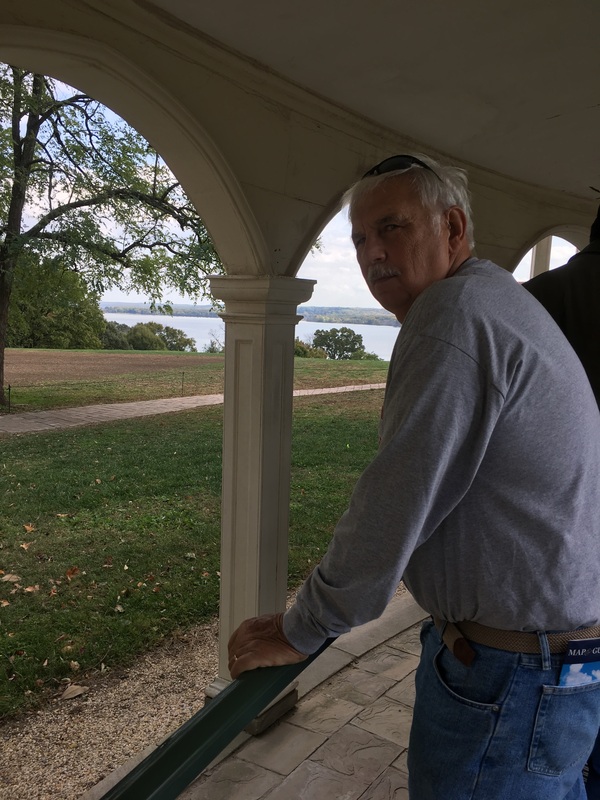 See the Potomac in the background. Our last stop was the museum and it was well worth the time spent there. It gave an overview of Washington’s life from birth to death. Some of the words that come to mind when I think of Gen. Washington are courageous, brave, humble, honest, leader, ingenious, hard working and devoted. After the war he resigned his commission and gave authority to the Congress. People wanted him to be king but he refused but later was selected as the first president. He served only two terms saying that no one needed to serve more than that. It was government by the people – can’t help but wish it was more that way now! After the museum we were tired and hungry having missed lunch so we headed to the car. We discussed going to the grist mill and distillery but decided against it and that was a good thing because the Garmin took us right through a residential area and we never saw the grist mill that we had seen coming in. Unfortunately we were not as lucky with traffic in the afternoon as we were in the morning and it took FOREVER to get out of the Washington area. After looking at the route that Garmin gave us I put the information into MapQuest and discovered a different shorter way although the time didn’t differ much. Despite the fact that the distance is only about 90 miles the time is quite a bit due I guess to traffic. When we realized that we would be home too late to prepare dinner we stopped at a Hardee’s in Spotsylvania. I haven’t been to a Hardee’s in years and I don’t know if the food was really that good or I was that hungry but I wolfed it down! We had just a few items we needed to pick up from the grocery store and since there was a Food Lion right there we went on over and got most of what we needed. Apparently Monday evening is not the time to buy green grapes! We finally arrived back at the campground around 8:00 and boy was it dark, not a light to be seen. Fortunately with the car lights and the lights on the ground by the RV we were able to see to get in. It didn’t take long for me to get ready for bed!